All eyes are on Tom Brady's throwing hand, as everyone wonders how big of a deal his hand injury is. Two men who have made their money throwing footballs tell us when it comes to accuracy and ball security, an injury here can cause big problems. Tom Brady didn't participate in practice Thursday due to his right hand injury, leaving many people wondering what impact his injury is going to have come Sunday, especially when it comes to gripping and throwing the football. 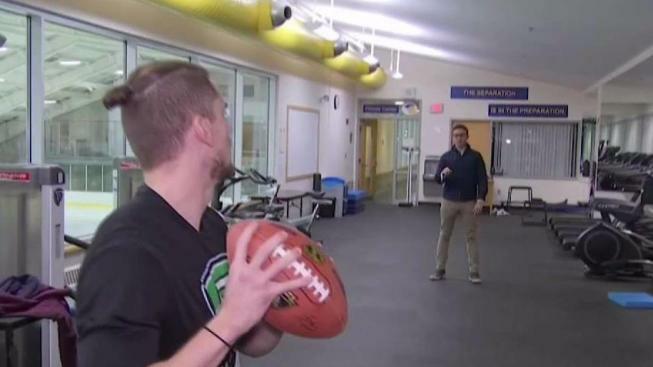 Two men who have made their money throwing a football told NBC 10 Boston, when it comes to accuracy and ball security, an injury here can cause big problems. "Being a quarterback, anytime it's throwing hand, it kind of worries you," said Sean Brackett, who knows the importance of a healthy throwing hand. The current arena football player and quarterback coach said that's why a healthy hand matters. "Basically you have pressure on it the entire time," he says. "Any hand-off, any throw, that thumb is going to play a major part of it, as far as ball security." At practice Thursday, Brady appeared to have a brace on his right thumb under his red glove. The mystery of the extent of the injury is adding to the intrigue, even for former Boston College and NFL quarterback Mark Hartsell. "I would never question Tom Brady but yeah, it has to add a little worry to you because it, it the most important thing on his body to throw a football," Hartsell said. But in the end, these quarterbacks say, let's remember who we are talking about here. "He is the goat, so there is no doubt in my mind they'll figure it out no matter the severity of the injury," Brackett said. What's Brady's take on this? We don't know because for the second straight day, he canceled his planned media session. It's now set for Friday as Patriots nation hangs on every update ahead of Sunday's AFC Championship game against the Jacksonville Jaguars.